chewing alder, raspberries, all and whatever’s left! funnel two legs and a pale belly pale! 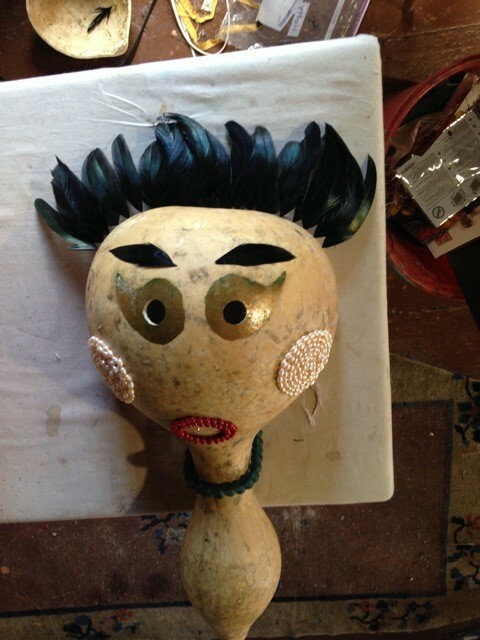 “A mask for a male goat pretending to be a turnip” appeared in Afterthought, a local ‘zine out of Brooksville, Maine. Oh Moon skull flying! Oh Moon skull shining! You who have taught me to love my small old eyes. with my tender horn as I wade in rivers, sink in shyness? and my slick face shines. then fly from my skull. had horns for beaks and hides under feathers. “A mask for a rhinoceros praying to the moon” appeared in Anthem Journal in spring ’15. “A mask for a rhinoceros praying to the moon” and “A mask for a male goat pretending to be a turnip,” created in a collaboration with weaver/ queer activist/ farmer Ron King of King Hill Farm, Penobscot, Maine were exhibited with masks made from gourds for the Farm Arts Exchange Reversing Fall Exhibit at The Gallery Within, Reversing Falls Sanctuary, Brooksville, Maine, 2014. The Farm/Arts Exchange in Down East Maine’s Hancock County was imagined as a way for artists to spend some time on organic farms, hang out and make something in response or collaborate with farmers. 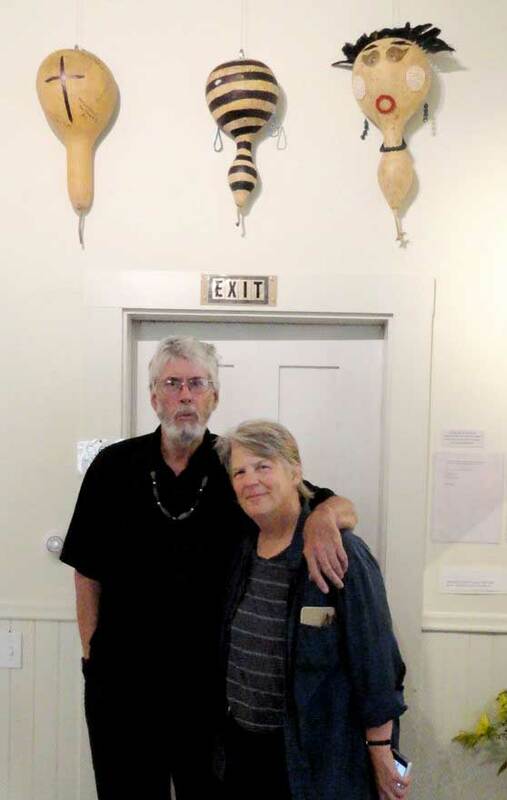 I chose to partner with my old friend Ron King–farmer, weaver, queer activist (Stonewall to present day), social worker, and wearer of masks—on Faerie Kingdom Road, King Hill Farm, Penobscot. First, we talked which is not unusual, but I asked questions about Ron’s growing up on the farm in Michigan, and made notes. We sat on his dark purple couch, while he knitted, TV blasting in the living room (painted bright blue, purple and mocha with alternating trim boards in orange, tan, and pink). He told me about farming in Michigan first, as a boy, and always making stuff, and always selling stuff which began with his job of pushing the wheelbarrow full of vegetables down to the road–corn and whatever else was coming in—and leaving the wheelbarrow and cash box. This was his job. He refreshed the contents and collected the money. He went on telling stories about learning stuff… Mother taught me to knit when I was 5: I loved it. She taught me and my older brother–he knit and I purled. It meant I had to wait for him, so I learned both and didn’t have to wait. Mother told me I was different. She protected me, and I hid behind her, my face buried in her apron. 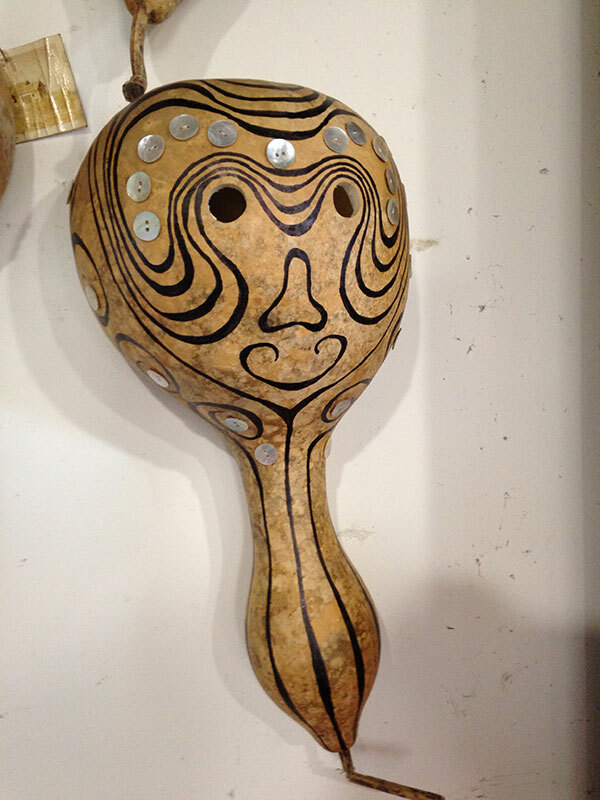 I remembered Ron saying he’d like to make some masks from gourds, so I brought it up—no pressure, what with his production weaving for craft shows, but just to see what happened. He’d been growing gourds in a greenhouse, drying and cutting them into vessels, then ornamenting with feathers, paint, pearls, and wire—porcupine quills pulled from road kill. No masks yet. It could happen or not happen, and collaboration is a process of throwing things back and forth. Ron is always at the loom weaving and turning things over in his mind, so I gave him a copy of Paul Lawrence Dunbar’s poem, We Wear the Mask. Meanwhile, I was walking the farm—maybe 25 of the 160 acres. I walked across the high rounded hilltop Ron cleared, the maple he left, when he saw the tiny sapling, right by his boot. I passed the old rock picker, eighty years and counting, and abandoned Russian tractor, walked around the log cabin that had burned and been rebuilt for apprentices, and the woodshed still streaked with charcoal from the flames, the beautiful brown and pink adolescent pigs, the tight blue-purple and green veined cabbage heads being harvested and back down through the woods to the farm pool in the clearing where the swamp had been dammed in case water ran low. I walked the rows and marveled at the deep, beautiful soil, the big open sky on the hill and all the work! Now run by a younger couple, Ron is the life-long tenant and gets to offer advice, when they ask. And ask they do, because he is a font of information, blunt and ever modest.